I had to have this stamp set before it was retired. It's a sock monkey! I used my ink pads and blender pens to color that guy. And here's a close-up of the Framed Tulips embossing folder; it really makes a deep impression and is a great detail on this card! And that's the Boho Blossom Punch. Isn't it cute?! Cute card! I love the embossing too. That little monkey is just too cute! Great blending Amanda. 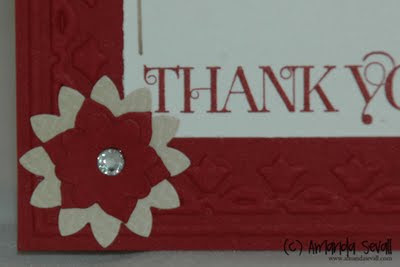 Love the embossing too!